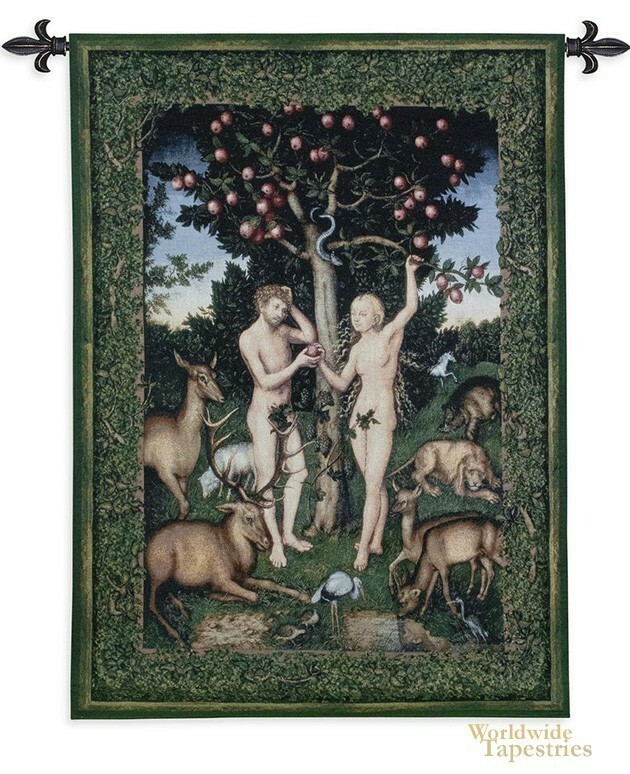 This tapestry shows a scene depicting Adam and Eve from the work of Renaissance painter Lucas Cranach. The original work from 1528 by this German Renaissance painter shows his interest in both mythological and religious subjects and their portrayal in his signature style. Cranach was the court painter for the Electors of Saxony and painted portraits of the leaders of the Protestant Reformation and became a close friend of Martin Luther. Here in this tapestry, we see Adam and Eve at the tree of knowledge where the forbidden fruit are seen on the tree as are the other forest creatures including the serpent. This scene is perhaps the most well known from the biblical texts and has inspired many artists to render this scene in their own style. Cranach embraces this topic with the Renaissance influence of the embrace of partial reality in style, with a sense of idealism in the composition to create a scene where there is a central focus of Adam and Eve with surrounding subjects of interest which helps to center the attention on the main subject placed in the center of the piece. This Renaissance art tapestry "Adam and Eve" is backed with a lining and tunnel for easy hanging. Note: tapestry rod and tassels, where pictured, are not included in the price.